Whether it's for classic cars, motorbikes or just tinkering around with motors, a steel building used as a garage or workshop gives you the space to work and a secure place for vehicles and your tools. Steel-built workshops are used up and down the country for both professional garage services and paintshops, to car enthusiasts who need a place out of the rain to work on their pride and joy. Steel buildings are both cost effective, but also have the doorway and access space and are easily set up with high ceilings to allow for the use of ramps and winches. They can also be fully plumbed and insulated keeping you indoors working on those cold winter days. Garages don't need to be workshops though. Sometimes a garage can just be a place to store a car or other vehicle to protect it from the weather or, in the case of collectors cars, to protect it from envious eyes - nothing more, nothing less. The great flexibility of steel framed designs is that you can choose - from a simple single bay space, to complex multi-vehicle garaging. 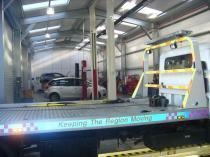 Get garaging and workshop help and quotes from leading metal-building suppliers. Just click the Quote Me button below to get started! For garaging and storage sometimes the simplest solutions are the best. 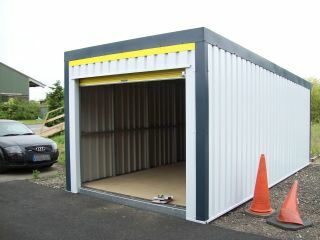 This is a small box-garage, perfect for storing classic cars over the winter where you don't need extra space, just somewhere secure and weatherproof. For professional motor technicians the space and building you work in is important for the quality of the work and the impression it leaves with the customer. Clean, bright interior spaces with a new steel building workshop leave the best impression and keep employees happy.